Indus Motor Company (IMC), also known as Toyota Pakistan, has launched the new environment friendly Corolla Ecotec XLi / GLi. The vehicle has been specifically designed and approved by Toyota Motor Corporation for Pakistan. 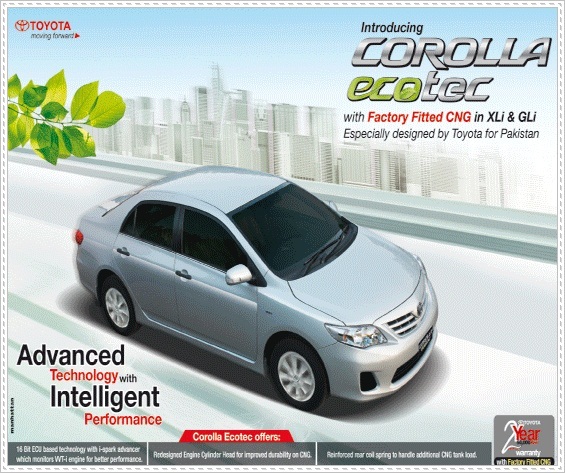 Corolla ecotec is the first Toyota Corolla which has factory fitted CNG system with Safety and Performance as per Toyota standards in 1.3 L grades. This makes it economical and environment friendly while delivering the same performance and durability as that of petrol variant. The development of this variant was in response to high consumer demand for factory fitted CNG in Toyota Corolla. Giving details about the new Corolla, IMC has issued the following statement: In response to the strong consumer demand we have developed Corolla Ecotec keeping in view the local driving conditions. 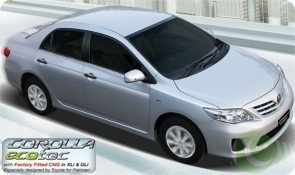 Corolla ecotec features a 2 Year or 50,000km warranty with Toyota standards. It is also features driving comfort as rear coil springs are reinforced to handle the additional CNG load.